It's not bad, but I think, that this can be sung much better. You need good singers and more synchrony in the singing. Uploaded by Teo Ntalakos on 2011-06-22. Sarah A., Sylvanta Sybil, Bob Ghoulio and 1 other person likes this. 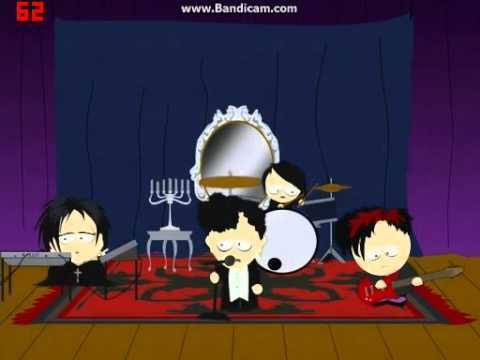 Those Goth Kids on South Park never got enough exposure! Thanks for posting! Canción de la maqueta "Demo #1" publicada en el año 2004. Ummmm and Bob Ghoulio like this. Just the fact it involves the name "squirrels." And of course the song rawks! Video shot by Romuald 'Ishoothorizon' Swieconek during rehearsals at the Twilight in Ostend (summer 2011). shadowcrow, Desire and morbidvampire like this. Ratz and christian like this. Lord Reidel and devilblack like this. This is the version from "Hell Comes To Your House" Which I believe is the best version. Since I could not find this version, I uploaded it. Enjoy! shadowcrow, Ummmm, Ratz and 2 others likes this. Track taken from the album - "SICKNESS" - released on the 10th of February 2012. "Passive" is a song by the alternative rock group A Perfect Circle. The song is a remake of the song "Vacant" by the now-defunct band Tapeworm. shadowcrow and Techwizard like this.